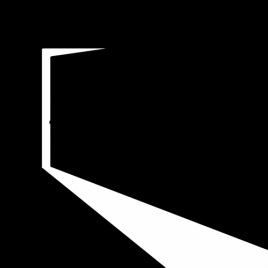 The doors of perception - opening the dark to the light - create the space between things that defines us, our ideas and our dreams. As the dark shifts and morphs, the shades take on different meaning, and ideas and concepts stand out. The artist feels something on a subtle level and is driven to express it, not from a conscious but from a subconscious mind. This opening of the subconscious enables the artist to create new work manifesting their personal observation of the world. Artists create their forms and color out of this space - thus inspiring the viewer to create new choices about how they see reality. What is dark, what was hidden, what needs to be revealed? This exploration of "Dark" showcases the artists' creation of new and alternative realities, where the worlds of landscapes, figures, architecture, objects, and natural phenomena are emphasized or subverted, revealed or obscured, and investigates the many layers that surround our traditional sense of the real. The artist’s dreams are brought to light from the dark. We are searching for art that captures this elusive place, deep within the creative spirit which captures a moment in time, with the elements of line, form and color - artwork that invites and opens an interaction with the viewer and thereby creates the possibility of alternative realities - either mentally, perceptually or structurally; challenging the status quo. Nancy Toomey graduated from New York University (Art History) in 1978 and did graduate work at UCLA. She has been the owner of Toomey Tourell Fine Art Gallery for over 15 years in it’s current location. Though based in San Francisco, Toomey Tourell represents artists from around the globe embracing a variety of disciplines. Through its exhibitions, the gallery encourages the development of artists, and fosters the myriad techniques and concepts that identify the contemporary art market. The shifting style and tone of the shows defies easy categorization, but a shared priority of artistic investigations and quality mark the exhibitions as a whole. A Juror’s Award ribbon and certificate will be presented to three works that express the most imaginative interpretation of the "Dark" theme. All artwork selected will be included in the exhibition catalog. Catalogs will be available for purchase online. 3-Dimensional Work: Must fit pedestal sized 16” x 16” or take up no more than 4 feet of gallery floor space. No artwork over 50 pounds. Artworks must arrive “ready to hang” and be presented professionally. No push pins. No sawtooth hangers. Framed artwork must use black wood, white wood, or natural wood frame. No color mats. No glass, plexi only. Artists will be notified by October 3rd, 2014. All artists who have submitted artwork will be notified by email. You may receive multiple notifications for acceptance into the Arc Gallery and On-Line Gallery. You will receive notification if no artwork has been selected. If you do not receive notice by October 3rd, please check your email spam folder and contact us if you do not hear from Arc. Tuesday, November 4th 5-7PM & Wednesday, November 5th 12-2PM, 2014 - IF YOUR ARTWORK IS ACCEPTED FOR THE ONLINE GALLERY ONLY, YOU DO NOT NEED TO DELIVER YOUR ARTWORK. All shipped artwork must be received by October 30th, 2014. Shipped works will be shipped back by December 10th, 2014. Work must be sent in reusable packaging with no styrofoam packing peanuts. Arc Gallery is not responsible for damage caused in transit. Artists are responsible for the cost of shipping and arranging prepaid shipping labels with either UPS or FedEx. It is mandatory to include prepaid shipping labels with your artwork or your work will not be exhibited. Artwork is insured only while on the premises of Arc Studios & Gallery from November 1st to December 7th, 2014, and according to the terms of our fine arts insurance policy. The coverage is limited to the fair market value of the artwork or $2,000, whichever is less. Saturday, December 6th 2-4PM & Sunday, December 7th 12-1PM, 2014. Artwork left behind may be subject to late fee of $50 per day and/or discarded by Arc Gallery. Since Arc Gallery started in 2010, nine artists blind-juried into Arc exhibitions have been selected for solo or group exhibitions and/or picked up for representation in other San Francisco Bay Area galleries. We are delighted that various artists who have submitted works to our juried shows have been given additional exhibition opportunities at Arc and other venues.